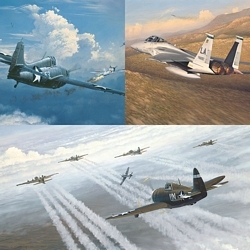 Aviation artist William S. Phillips has meticulously documented, through more than a dozen paintings, the historic Doolittle Raid, a turning point in WWII and military history. Lt. Colonel Jimmy Doolittle's April 18, 1942 raid on Japan began with the loading of sixteen B-25s aboard a Navy aircraft carrier, the USS "Hornet," for the first time. This painting depicts the ships of Task Force 16.2, sailing from San Francisco Bay on the beautiful sunlit morning of April 2, 1942. Doolittle’s intention was to launch one plane when the ship was off the California coast in order to prove to his men that it could be done. Lt. Miller’s unflagging confidence in the ability of the planes to safely leave the deck of the ship convinced Doolittle and Captain Mitscher to save that extra plane for the raid itself.